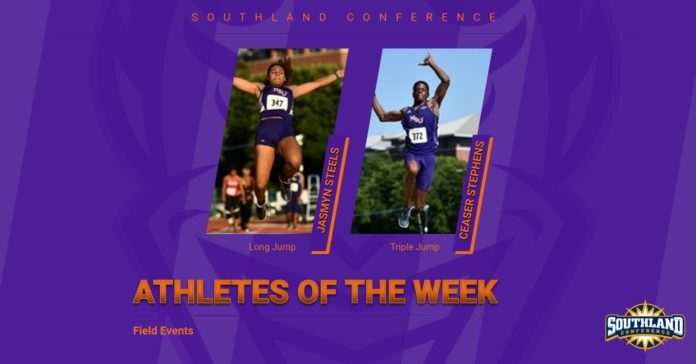 For a second straight week, Northwestern State track and field competitors won Southland Conference honors Wednesday as jumpers Jasmyn Steels and Ceaser Stephens were voted field athletes of the week after both claimed gold at the LSU Bayou Bengal Invitational last Friday. Steels, a junior from College Station, Texas, won the women’s long jump with a mark of 20-7 ¼ that ranks ninth in the country, sharing that distinction with another Southland standout, Sarea Alexander of UIW. Stephens, a senior from Opelika, Alabama, recorded his second 2019 indoor victory in the triple jump on a season best mark of 50-9 ½. That jump ranks second in the Southland behind Tylen Guidry of Lamar. Last week, NSU junior sprinter Natashia Jackson won the female track athlete of the week award from the conference. The Houston native ran a SLC season-low 55.11 in the 400 meter dash at the Pittsburg State Invitational, winning the event for the first time this year. The Demons and Lady Demons compete in the UA Tyson Invitational in Fayetteville, Arkansas, on Friday and Saturday before heading back to Baton Rouge for the LSU Twilight Meet on Feb. 15. The Southland Conference Indoor Championships are set for Feb. 24 in Birmingham, Alabama.